Set in a wide valley sometimes flush with grass, accommodation at Desert Rhino Camp is in the form of 8 Meru-style canvas tents that sleep up to 16 guests. Raised from the ground on a wooden deck, each tent features an en-suite bathroom with a hand basin, flush toilet and shower. Beds are made up with crisp, white linen and have two dark wood bedside tables with wicker reading lamps. An extension of the deck functions as a front veranda where guests can relax in director's chairs to take in the magnificent vistas of the surrounding desert and Etendeka Mountains. Extra duvets are available for the sometimes frosty nights. The tented dining and lounge area of Desert Rhino Camp is also raised on a wooden deck in a single tent which is open plan and has partially open sides offering panoramic views. To one side there are couches and to the other a large, simple dining table. Evening meals are taken around the fire pit, in front of the lapa, where guests can relax and socialise. Palmwag Concession's freshwater springs also support healthy populations of desert-adapted elephant, Hartmann's mountain zebra, giraffe, gemsbok, springbok, kudu and predators such as lion, cheetah, leopard, brown and spotted hyena. Bird life is prolific and diverse with most of Namibia's endemics present. There are large populations of Hartman's mountain zebra, giraffe, Oryx, springbok and kudu. The predator population is the largest outside of the Etosha National Park with over 100 lions, cheetah, leopard, brown and spotted hyena. Bird life is prolific and diverse with most of Namibia's endemics present. This concession supports a healthy population of desert adapted black rhino and elephants. 12v power with facility to charge video batteries. Limited laundry facilities are provided at no extra cost. Minimum age limit 8 years. 8 - 12 years sharing with parents or in family unit: above discounted rates. 13 years and above: full rate even if sharing with parents. No family rooms are available. Families of 3 can still be accommodated in a triple room subject to availability. 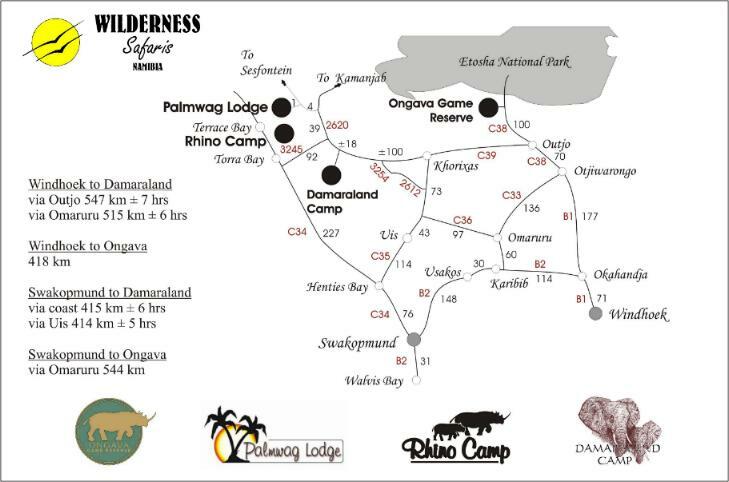 MINIMUM STAY AT DESERT RHINO CAMP IS 2 NIGHTS!